Food security is defined as a situation when ‘all people, at all times, have physical, social and economic access to sufficient, safe and nutritious food that meets their dietary needs and food preferences for an active and healthy life’ (Food and Agriculture Organization, 2002). This definition brings together food consumption, nutritional status and health, as well as vulnerability and coping mechanisms. Food security crises are seldom discrete events, they have their roots in chronic vulnerability so while it is vital to address the immediate symptoms of food security crises, it should be recognized that addressing these symptoms seldom tackles the longer-term causes of food insecurity and there is therefore a need for both appropriate emergency interventions and coherent linkages to longer-term food security responses. Our guiding principle should be Disaster Risk Management – in all our programming. Food insecurity is multi-dimensional and represents an outcome of a range of factors. In order to address it, we need to look at a range of issues. In the past, food security has often been equated with food aid, especially in emergency responses. However, food security focuses on people’s ability to obtain food, rather than just on food production or supply. Food production is necessary but not sufficient for food security. People access their food from many sources: their own production, purchase, the exchange of household production, labor or gifts. Food availability-the amount of food that exists physically in a country or area through all forms of domestic production, commercial imports and food aid. Food availability may be aggregated at the regional, national, district or community level, and is determined by production, trade, stocks and transfers. Food access-the households’ ability to regularly acquire adequate amounts of food available through a combination of their own stock and home production, purchases, barter, gifts, borrowing or food aid. Inadequate maternal and child care practices: Refers to the social and caring behaviours within the household and community which influence caring behaviours. They include appropriate child care (especially optimal infant and young child feeding), hygiene, emotional support, and health behaviours key to good nutrition and health. Care is also affected by gender and cultural issues. Underpinning the 3 underlying causes outlined above are basic causes of malnutrition that are the result of resources available (human, structural, financial) and the political ideology affecting how these resources are used. Food and Nutrition security requires all three underlying causes to be addressed. For example, certain households may be food insecure-even though food is available locally-if they are unable to secure sufficient quantity or diversity of food for household use. Similarly, an individual may remain food insecure-even if food is available and accessible-if their body is unable to absorb the nutrients due to poor health or poor preparation. household choices made within in the opportunities and limits of the previous two points. For more information about livelihoods approaches, see Annexes 23.1 Managing risk, improving livelihoods: Program guidelines for conditions of chronic vulnerability, Annex 23.2 Household livelihood security assessments: A toolkit for practitioners, and Annex 23.3 The practitioner’s guide to the household economy approach. Standard and inappropriate responses are often implemented due to inadequate response analysis based on the needs assessment. ‘Off-the-shelf’ interventions that do not take account of local priorities rarely work. Each intervention must be designed to suit the local context. Do not assume that a need for food also means a need for seeds. Specific seeds assessments should be conducted before major seeds and tools distributions. A ‘food-first’ bias, which assumes that addressing food security alone, will achieve significant impacts on malnutrition. It is important to assesses the relative importance of the three underlying determinants of malnutrition, and design the interventions accordingly. Do not implement food- or cash-based interventions without a sound market analysis. The introduction of food or cash and vouchers will have an impact on the local market, which can make food less accessible for the most poor if market dynamics are not properly understood or the right interventions planned. Do not implement food programmes without attention to gender roles and power. This can lead to food programmes providing opportunities for abuse of power and exploitation. Measures to prevent and respond to sexual exploitation must be integrated into programmes. If a CO has in-house capacity for food and nutrition security, it should be used given familiarity with local and national norms, customs and standards. Specialist advice should be called upon where local capacity is overwhelmed, or where the scope or nature of the emergency demands support. CARE International rosters for deployable emergency personnel include specialists with experience in food & nutrition security, food distribution, food logistics, and markets and cash based programming. CARE’s emergency food & nutrition security capacity is strongly rooted in COs and the projects they implement. So, many of these staff are located in other COs, supported by a limited number of deployable specialists at a CARE International Member or regional level. To access these personnel, COs should follow the procedures for activating emergency personnel described in Chapter 21 Human resources. Senior Advisor for Emergency Programming, Justus Liku, emergencyfoodsecurity@careinternational.org. For advice on nutrition or infant and young child feeding, contact CARE USA’s Sexual Reproductive health unit, via Kamlesh Giri iycf&e@care.org (see Chapter Health, and Chapter Infant and young child feeding in emergencies). For advice on livelihood programming and economic recovery in emergencies, contact the CARE USA Economic Development Unit, Laté Lawson, economicrecovery@careinternational.org (see Chapter 8.6 Economic recovery). To request deployment of a food and nutrition security expert, contact the CI Emergency Human Resources Coordinator, emergencyHR@careinternational.org. External to CARE, the Emergency Nutrition Network (ENN) has launched an online forum for people working in emergency nutrition and food security. The forum is en-net and aims to provide fast support and guidance challenging issues in the field, prompt technical advice for operational dilemmas, as well as links to key resources. En-net hopes to link field practitioners, researchers and technical experts to discuss the current issues for which there may not be accessible published guidelines. You can find the forum at http://enn.cmail3.com/t/y/l/dhkyc/itkultllh/r or via the link on the ENN website. CARE also recognizes that no single organization can address today’s complex food and nutrition security challenges. Partnership is more important than ever. CARE should work closely with local governments and a wide range of other actors, including international organizations, NGOs, civil society and private-sector businesses.  CARE has experience and a strong reputation in emergency food and nutrition security programming. A recent assessment has outlined CARE’s capacity in this area (Annex 23.22). 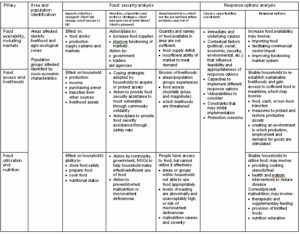 CARE’s capacity is strongest in food security analysis (early warning, emergency needs assessment, M&E, and scenario analysis and planning) and food aid delivery. CARE’s emergency food security capacity is strongly rooted in COs and the projects they implement. CARE is known for its ability to deliver food aid in emergencies, and has extensive experience in supporting productive activities and protecting assets in emergencies, especially seeds and tools. Worldwide, CARE is one of the WFP’s large implementing partner and typifies CARE’s reliance on in-country capacity. A new strength building rapidly is capacity to implement cash based interventions and this is again well embodied at the Country offices. The role of the WFP and Title II projects warrants particular attention. CARE has historically received significant funding from USAID FFP for both Development Food Assistance Projects and Emergency Food Security projects. Much of CARE’s in-country capacity is closely associated with these projects and the ongoing funding they provide. The emergency food security strategy aims to promote the expanded food assistance tool box which includes food aid, cash transfers, and seeds & tools and embarks on capacity-building in emergency food security programming. Work to strengthen CARE’s capacity in food security may consider further developing areas such as the use of digital technologies in cash transfers and vouchers in emergencies, innovative approaches such as seed fairs, and pastoral livelihoods work, and embracing resilience from the start of emergencies response. Other areas for future strengthening include nutritional programming and analysis, market analysis and response analysis.